Maryland Advance Directive (Medical POA & Living Will) which may be used as a living will and/or medical power of attorney, is a form that you use to plan ahead for a health crisis when and if you cannot make your own determinations for care. The first part allows you to choose someone, usually a spouse or relative or trusted friend, to make medical decisions on your behalf and in your best interest and according to your wishes. The second part allows you to specify the types of end of life care that you prefer to be administered. The advance directive statute in Maryland is located at 5-601 of the Maryland Annotated Code. Durable (Financial) Power of Attorney – This POA is used to confer authority to an agent to make financial decisions on the Principal’s behalf. The paperwork necessary to declare a Health Care Representative or Health Care Agent in the State of Maryland can be downloaded after opening it using any of the three buttons below the image. Open and download this form in any of the file formats presented. This form will begin with a definitive identification of the Principal (the individual appointing a Health Care Agent). On the blank space labeled “Print Name,” below the title, present the Name of the Principal in print. To further identify the Principal responsibly, enter the Principal’s Birthday on the blank line after the words “Date of Birth.” Do this in the Month/Day/Year format. Section A or Part I, “Selection of Primary Agent,” provides an opportunity to name the Health Care Agent. This is the person who the Principal wishes to make Health Care Decisions on his or her behalf. Naturally, we will have to fill in his or her Full Name with some defining information. On the blank line labeled “Name,” enter the Primary Health Care Agent’s Legal First, Middle, and Last Name. Then, on the blank line labeled “Address,” enter the Primary Health Care Agent’s Legal Residential Address. Finally, on the blank line designated “Phone Numbers,” enter the Primary Health Care Agent’s Home Telephone Number and Cell Phone Number. Locate Section B, “Selection of Back-Up Agents.” This section is entirely optional. If the Principal has decided to keep some Agents in reserve, should the Primary Agent be unable to fulfill his or her role, this Back-Up Agent may be documented here. There will be two distinct areas where the Name, Address, and Telephone Number of each Back-Up Agent may be documented. If there is more than one Back-Up Agent, enter their information in the order you wish them to assume Power. That is, the first Back-Up Agent will take the place of the Primary Agent if he or she is unavailable while, the second Back-Up Agent will take the place of both Primary and Secondary Agent if they become available. Section C, “Powers and Rights of Health Care Agent,” will list four statements for Principal review. Each statement will provide a definition which will be approved of by the Principal once this form is signed. The Principal may cross out any statement he or she does not wish to apply to the Powers and Rights being delegated to the Agent. Cross out Statement One to deny the Agent Power to consent to Medical Procedures/Treatments, Statement Two to restrict the Agent from deciding who the Principal’s Doctor/Health Care Provider should be, Statement Three to restrict the Agent from controlling the Principal’s Admission and Discharge from Health Care facilities of any kind, and any part of Statement Four to prevent the Agent from riding in the Ambulance with the Principal and/or visiting the Principal in a Health Care Facility. If there are any conditions, limitations, or circumstances that must apply to the delegation of these Powers, the Principal may make them known in the box labeled “This Power Is Subject To The Following Conditions Or Limitations. Some Principals may prefer their Health Care Agents consult with a Professional, Family Member, or Friend. In addition, they may have some very specific preferences as to who exactly these consultations should take place with. You may use Section E, “People My Agent Should Consult,” to document the Full Name and Telephone Number of everyone the Principal’s Health Care Agent should consult when making Health Care Decisions on behalf of the Agent. Two columns for this purpose have been provided: Name(s) and Telephone Number(s). Each individual listed here must have his or her Full Name recorded along with an up to date Telephone Number where that person may be reached fairly immediately. Section F, “In Case Of Pregnancy,” supplies a distinct area where the Principal can give specific instructions regarding Health Care decisions the Agent makes on behalf of the Principal if the Principal is pregnant at the time. You may either provide these instructions in the text box or you may provide them in an attachment that is properly labeled and attached to this form before its completion. Read Section G, “Access To My Health Information – Federal Privacy Law (HIPAA) Authorization,” which will define the access to Principal Information and Principal Power the Agent will have. The First Statement will provide the Agent with the right to discuss the Principal’s Health Care before this document takes effect. The Second Statement gives the Agent access to receive and review any Medical and Mental Health information pertaining to the Principal. The Third Statement gives the Agent the right to sign all HIPPAA related material as the Principal’s representative. If the Principal does not wish to designate some Power statements as applicable to the Agent named above, they may be struck out or removed, however, it is strongly suggested to consult with an Attorney or appropriate professional before doing so. Section H, “Effectiveness Of This Part,” will require the Initials of the Principal to define which statement will describe when the Principal Health Care Powers delegated to the Agent will take Effect. If the Agent is able to make Health Care Decisions immediately upon the Principal’s Signature at the end of this form, the Principal will need to initial the blank space corresponding to Statement 1. If the Agent will only have Principal Health Care Powers when the Principal is diagnosed as being unable to make his or her own Health Care Decisions either temporarily by an attending physician or permanently by two doctors, the Principal will need to initial Statement 2. 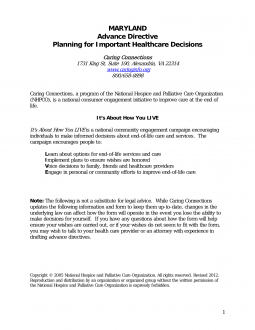 Part II delivers the framework for the Principal to document his or her preferences regarding lifesaving and end of life decisions. This part does not have to be filled out if the purpose of this form is to simply name and Agent, however, many consider it wise to include this part in one’s directive. The first section in Part II, “Statement of Goals and Values,” is the specific area where the Principal may document any declaration regarding his or her goals, values, ethics, and concerns that should be kept when the Agent makes a decision regarding the Principal’s end-of-life preferences. Use the empty box below the words “…during the last part of my life,” to report the Principal’s concerns. The next area of this form, “B. Preference In Case Of Terminal Condition,” will present several statements, each with a corresponding blank space. The Principal will need to initial the blank line for the statement that reflects his or her wishes when diagnosed with a Terminal Condition where death cannot be prevented. If the Principal wishes for a Natural Death (meaning no medical interventions, including artificial nutrition/fluids) to occur, then he or she should initial the blank line corresponding to the first statement. If the Principal would like to experience a Natural Death, with no medical life-extending interventions, but would like to receive Artificial Nutrition/Fluids when required, then he or she should initial the second statement. The Principal may wish to extend his or her life for as long as possible using any reasonable medical intervention possible (including the intake of Artificial Nutrition/Fluids), the Principal should initial the Third Statement. In the “Preference In Case Of Persistent Vegetative State,” the Principal will initial one statement that best applies to his or her preferences if ever diagnosed in a lasting Coma or Persistent Vegetative State. If the Principal wishes to be allowed to pass from a Vegetative State to a Natural Death with no medical interventions (including Artificial Nutrition/Fluids), then he or she should initial the First Statement in Section C, Part II. If the Principal prefers to be kept comfortable (i.e. Artificial Nourishment) but If the Principal prefers to be kept comfortable (i.e. Artificial Nourishment) but allowed to Die Naturally, when diagnosed with a Permanent Vegetative State, then he or she must initial the Second Statement. The Principal should initial the Third Statement if he or she wishes to be kept alive for as long as possible (allowing Medical Intervention and Artificial Nourishment). The “Preference In Case Of End-Stage Condition,” will present a few statements meant to describe the Principal’s Preferences if he or she is ever diagnosed with an Incurable Condition that causes complete Physical Dependency or true Loss of Capacity. The Principal will need to initial the statement he or she would like the Agent to apply to such a situation. The Principal may elect to be kept comfortable and allow a Natural Death to occur. This will mean that no Medical Interventions or Artificial Nourishment will be administered at any time. If the Principal prefers when rendered Physically Dependent or Significantly Incapacitated, then he or she must initial the blank space corresponding to the First Statement. If the Principal wishes a Natural Death to occur and would prefer Artificial Nourishment (if necessary) but does not want any Medical Procedures to extend life, then he or she should initial the Second Statement. If the Principal wishes to be kept alive in the event of being rendered severely disabled or incapacitated, even when Medical Intervention or Artificial Food/Fluids must be administered, then he or she must initial the Third Statement. Section E, in Part II, will state the Principal wishes to receive treatment for Pain Management. It is strongly recommended the Principal consult a Physician before removing or crossing out this statement. If the Principal is in child-bearing years and wishes to give instructions regarding end-of-life decisions while pregnant, her wishes may be documented in the text box in Section F, Part II. Section G, the “Effect of Stated Preferences,” will address unforeseeable events. If the Principal will allow some flexibility in Medical Decisions not discussed here, he or she should initial the First Statement in this section. If the Principal will only allow the Agent to carry out instructions listed here exactly as they are reported, then he or she should initial the Second Statement. The granting Principal must sign this document for it to take effect and the Health Care Agent to act as such. In Part III, “Signature and Witnesses,” the Principal must sign the line labeled “Signature of Declarant.” Once this task is completed, the Date of the Signature must be presented by the Principal on the line labeled “Date.” Next, the statement beginning with the words “The Declarant signed or acknowledged signing…” is a testimonial that may only be signed by the two individuals who have physically watched the Principal sign this document. Two sets of blank spaces (“Signature of Witness,” “Date,” and “Telephone Number(s)”) have been supplied so that each Witness may sign his or her Name then enter the Date of Signature and Telephone Number where he or she may be reached. While the Health Care Power form has been completed, an additional form has been provided so the Principal may address the subject of Anatomical Donations. This is optional. On the page titled “After My Death,” print the Principal’s Full Name on the first blank space Then, enter his or her Birthday on the second blank space. Beneath the heading “Part I: Organ Donation,” the Principal will have several statements. Each statement the Principal approves must be initialed by the Principal. If the statement does not apply, it should not be initialed and may be crossed out. The Principal may initial the blank space corresponding to the statement “Any Needed Organs, Tissues, or Eyes” to allow any body part to be donated after death. If the Principal only wishes to donate specific body parts, he or she should initial the line item “Only The Following Organs, Tissues or Eyes” and record what body parts may be donated on the text box provided. The next line items “For Transplantation,” “For Therapy,” “For Research,” “For Medical Education,” and “For Any Purpose Authorized By Law” all refer to what purpose the Principal will make an Anatomical Gift for. The Principal may initial any of the first four line items if he or she has specific preferences or may initial the last statement to grant an Anatomical Donation regardless of the Purpose. The choices presented are: For Transplantation, For Therapy, For Research, For Medical Education, and For Any Purpose Authorized By Law. If the Principal has additional considerations regarding his or her remains, they may be reported in the text box provided. The last part of this form is Part IV, “Signature and Witnesses,” where the Principal must sign the blank space labeled “Signature of Donor” then enter the Date he or she signed this paperwork on the adjacent line. Below this will be a testimonial that two Witnesses should provide their testimonial Signatures, relevant Signature Dates, and Telephone Numbers.